How to Assign a Deck to A Classroom? You may assign one or more decks to your Deck.Toys Classroom. Teachers on the Free plan may assign up to 2 decks to a single classroom at a time while teachers on the Pro plan can assign up to 10 decks. 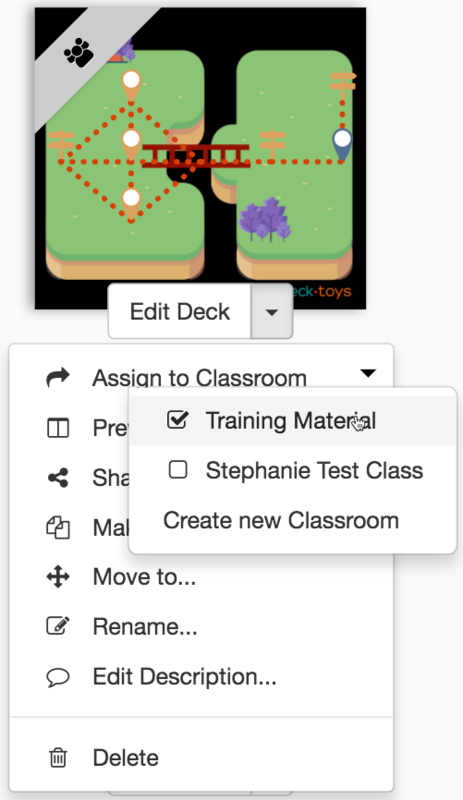 There are several ways you may use to assign a deck to a Deck.Toys Classroom. At the selected deck, click on the drop-down menu at the 'Edit Deck' and 'Assign to Classroom'. Choose the Classroom which you would like to assign to. In the 'Preview Deck', click on the 'gear' icon at the top right corner of your screen. Click on the 'Assign to Classroom' and select the Classroom that you desire. In the 'Deck Builder' screen, click on the 'gear' icon at the top right of your screen. Click on the 'Assign to Classroom' and select the Classroom for the deck to be assigned to.